It is a stunning three-masted tall ship but, for part of its short stay in Belfast, the Kaskelot doubles up as an outdoor cinema. Visitors have been coming on board to view archive footage, including some of Northern Ireland's maritime past, from years gone by. But it is after dark that the ship's sails turn into silver screens. Footage and films are projected on to them as night falls, and the masts are lit up with lights. It is all part of Celluloid Sail, a project curated by the organisation Compass Presents in partnership with the British Film Institute's Britain on Film archive. The films shown on board were chosen specifically with Belfast in mind, said Celluloid Sail producer Tara Sachdeva. "This year of Britain on Film concentrates on archive filmed around our coasts," she said. "Some of the content we found was about an old prawn festival, for example, which was an unusual celebration. "Then there is other footage about the industry and history of the maritime area here." She added: "In the daytime people can see that under deck, and then at night from about 21:00 they view from the harbour. "We've got beautiful lights that pick out the sails and the rigging, and then we're going to be projecting on to some of the ship's sails." Aside from what is being shown on board, the Kaskelot itself has an interesting story to tell, according to the ship's manager Jessica Atkinson. "She's a bit of a mongrel, like all the best ships," she said jokingly. "She was built in 1948 in Denmark out of pure oak for the Royal Greenland Trading Company. "She was trading up that coast for quite a few years and was then a fisheries support boat in the Faroes - since then she's been used for a lot of film and movie work." The Kaskelot has previously been featured in the BBC series Poldark, as well as films including Shackleton and The Three Musketeers. 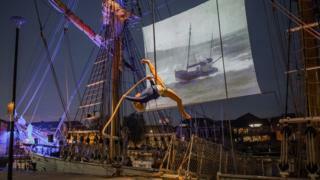 It is in Belfast until 18 June, with the Celluloid Sail event takes place later on Thursday. Access on board is free apart from a ticketed showing of the Hollywood film The Life Aquatic with Steve Zissou, which is showing on Thursday night. After its stay in the city, the Kaskelot sails across the Irish Sea to Liverpool.